A crowd of Algerians is celebrating President Abdelaziz Bouteflika’s resignation after 20 years in power and weeks of mass protests. An official in Bouteflika’s office told The Associated Press that the leader resigned, a few weeks before the end of his fourth term. The move came after six weeks of mass protests and soon after the army chief urged him to step down immediately. Algeria’s state news agency APS is reporting that embattled President Abdelaziz Bouteflika has quit, informing the country’s constitutional council of his decision to stand down. 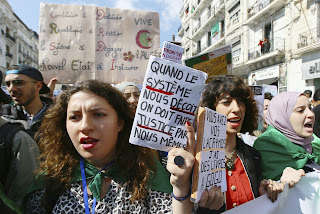 The news came shortly after the Algerian Defense Ministry aggressively called Tuesday for Bouteflika to quit “immediately.” The ministry, which controls the army, had said “there is no more time to waste” after six weeks of nationwide protests against the chief of state and his inner circle. Algerian Defense Ministry has called for President Abdelaziz Bouteflika to quit “immediately” after two decades in office. In a statement sent Tuesday, the Defense Ministry said “there is no more time to waste” on the constitutional process to have Bouteflika declared unfit for office and to give Algeria’s people a voice. Algerian protesters and opposition leaders say President Abdelaziz Bouteflika’s long-awaited announcement of his departure has fallen flat. Protesters and opposition figures say it doesn’t go far enough to satisfy demands for dramatic change to the country’s secretive power structure. Former Prime Minister Ali Benflis and a moderate Islamist movement are among leading voices criticizing the move because it would leave the country’s secretive, distrusted power structure in place. A standoff is also intensifying between Bouteflika’s entourage and that of the powerful army chief, who turned against the president amid mass protests over Bouteflika’s 20-year rule.